Thanks to our colleague Anthony Shore for tipping us off to this breaking news about those sneaky bastards at AIG. Following up Ryan Grim’s report from Congress last week that AIG chief Edward Liddy was looking to change the company’s “thoroughly wounded and disgraced” name, it appears as though words are being put into action. The massive insurance operation will henceforth be known as AIU Holdings, Ltd., a process that began this past weekend with the removal of the large, front-end AIG sign from the its Manhattan office. AIG has said it may sell the headquarter building, as part of its drive to raise funds to repay its debt to the U.S. government. 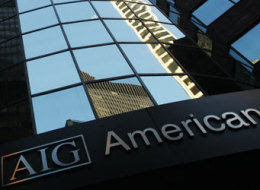 We think AIG should change their name to GAG. They will only have to buy one vowel, which is about all they can afford.